Writing a condolence message to the family of the deceased is not always an easy task for everyone, this is because some people try to show sympathy but they end up saying wrong things in the condolences message. Having a sample to guide you while writing such a message is highly recommended since it ensures that the aim of writing such a message which is to show sympathy is met. This post reviews various types of condolence messages You can also see Baby Shower Messages. 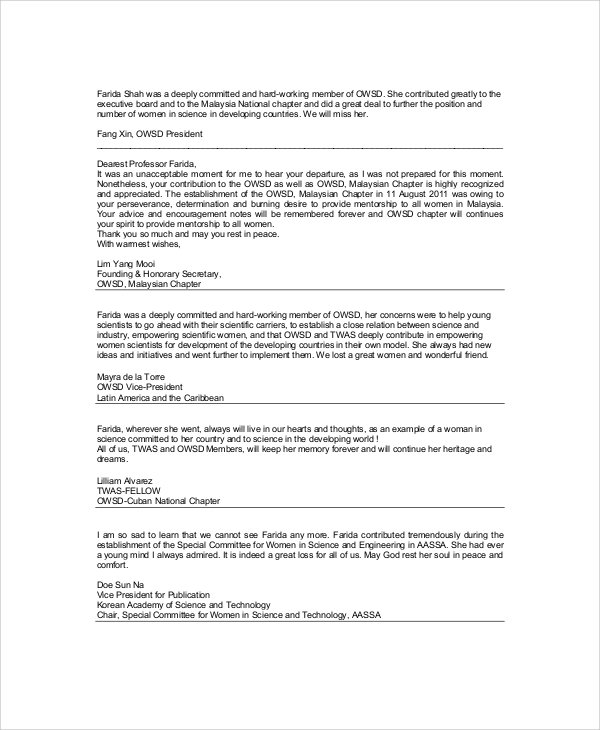 A death condolence message sample is a small letter prepared to guide people who write a condolence letter to their friends or the family of their friends after they lose a person. The sample can either be used as a guide for customizing. When one of a corporate member dies or loses a family member a condolence message or letter is written to the deceased family. 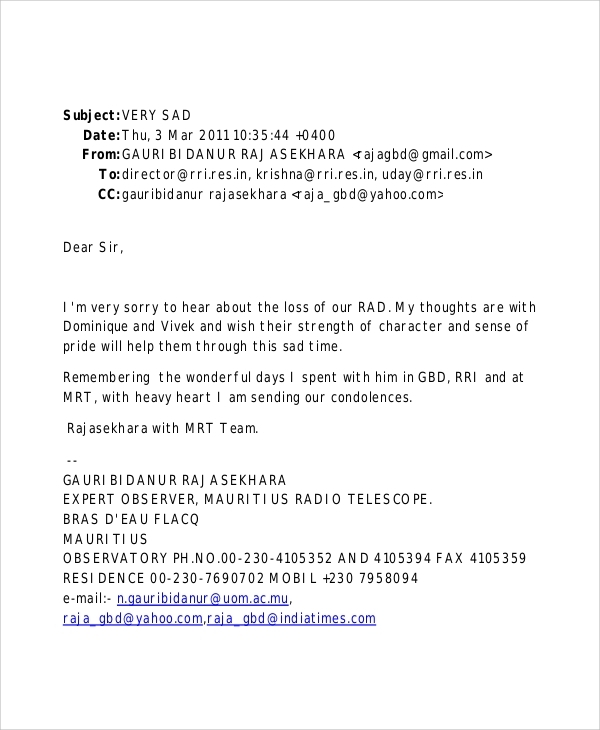 The sample was prepared to guide the head of corporates or the secretary on how to write a simple and effective condolence letter on behalf of the corporate. 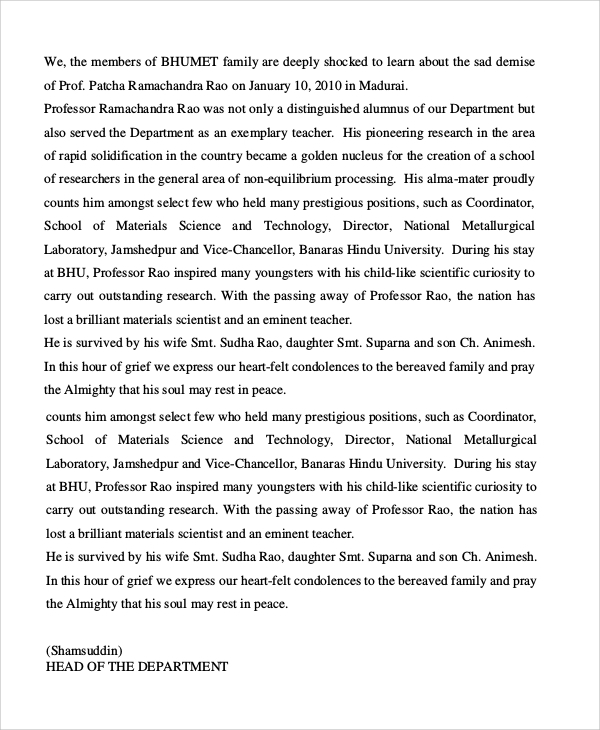 This is a condolence message sample written informal tone and style. The sample is fully customize; it can be used as a guide or as a template to help people write a condolence letter in a formal tone. The sample can be accessed from our website for free. An official condolence message sample is same as formal condolence message and the only difference between the two is one is for official use only and the other can be used anywhere. The sample can be easily customized and produce an effective sympathetic message for the deceased family and friends. One of the things you should consider while writing a condolence message is to avoid producing the wrong message in the tone. The tone that is used while writing a condolence message should be positive and sympathetic. 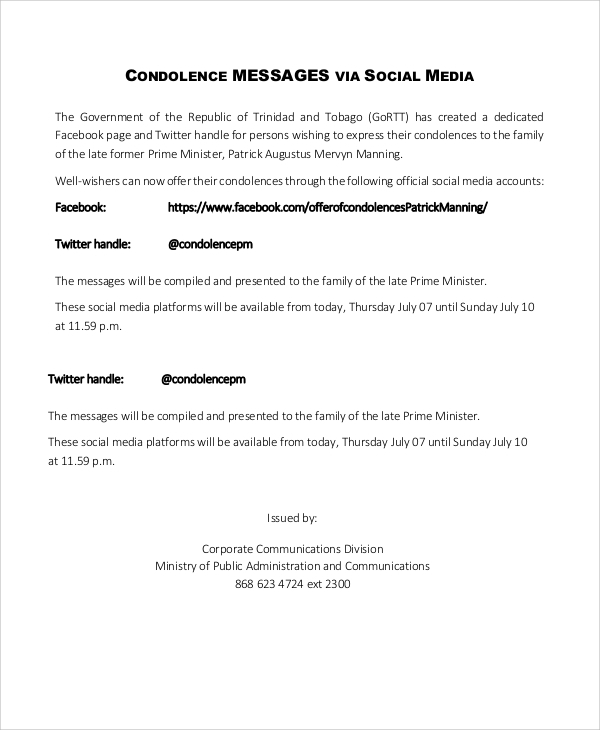 Choice of words to use in a condolence message also matters a lot. The message should be short clear and concise so as to ensure the reader gets the message right. The condolence letter should be written during the period where the family is preparing the burial and not after the burial as it may not be as effective as it is expected. Whenever writing a sympathy letter you should try as hard as possible to ensure that the letter delivers the message you expected. 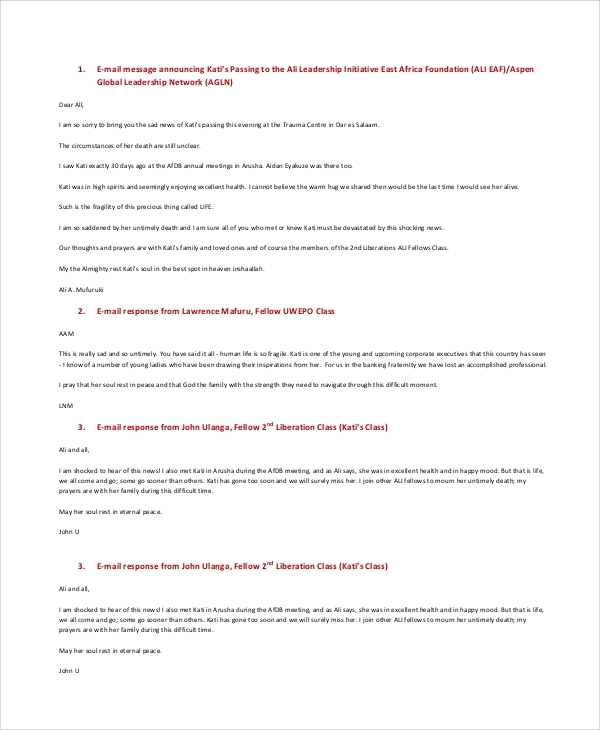 Here are few tips to help you achieve that; the letter or the message should be as short as possible, trying to include the funny memories in the condolence message also makes the condolence message more felt, respecting the religious beliefs of the deceased family should also be observed, never mentioned the deceased owes you or the financial offer you will give family. If you follow this tips shared here, the chances of your condolence getting misunderstood are next to nil. 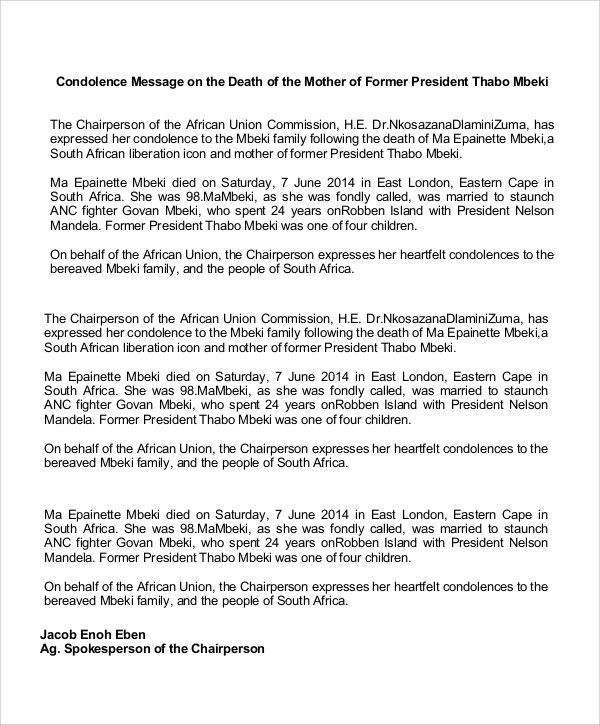 Why is a Condolence Letter/Message Important? A condolence letter is important it shows the family of the deceased that you are there for support through the bad times they are facing, it also makes them feel loved and relieve them sadness. 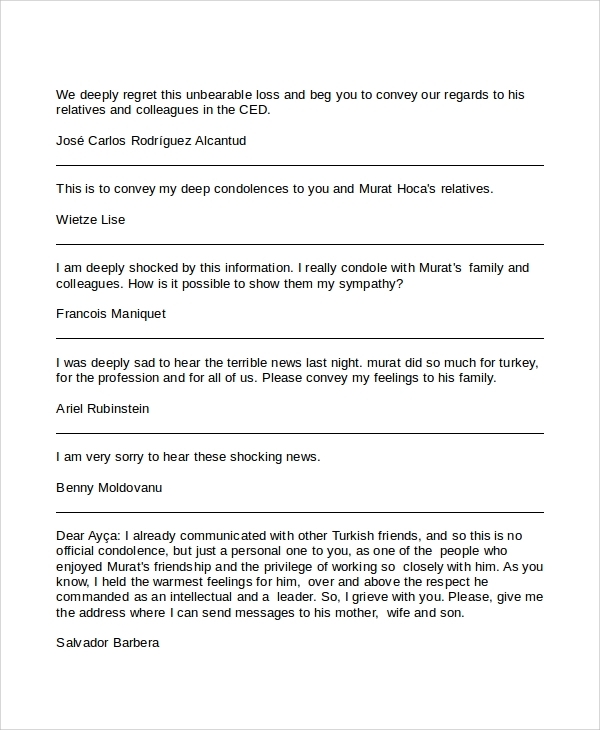 A condolence letter proves you are real friends and it may pave way for greater deals in the future which may also benefit you. Companies or organizations sometimes they take advantage of sending condolence messages as a way of creating awareness and marketing themselves. Learning how to write a condolence is something that everybody should do, it ensures that you write an effective condolence message and strengthens the bonds of the deceased family and the friends. For people who don’t know how to write one they can download samples from our site and customize them. You can also see Sample Holiday Greeting Messages.